Horizon Plastics International has just launched Sport Bins, rugged storage solutions for avid hunters, fishermen and outdoorsmen. 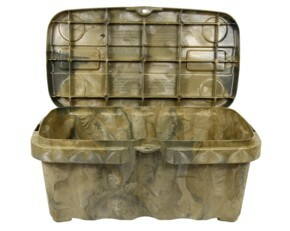 Sport Bins come in Green Camo or Sand Camo and are available in standard or truck bed mountable configurations. Built by a unique manufacturing process using structural foam for incredible strength and light weight, the bins feature rugged hinging, padlock compatibility, built in bungee tie-downs, built in cup holders, and they are stackable. Each bin measures 31” x 17.5” x 13.5” and has a 20 US gallon capacity. The standard bin weighs just 13-pounds with the truck mountable model coming in at just 17-pounds.